I have to admit - I am a sucker for anything that is sour cream and onion flavored. I grew up adoring Lays Sour Cream and Onion potato chips which, for obvious reasons, are no longer a part of my "eat smarter" regular diet. So, when I came across these Mr. Krispers Sour Cream and Onion flavored Baked Rice Krisps at Whole Foods a while ago, I just had to give them a try. I've tried some of the other "better for me" chips and crackers that are out there in the past, which I've liked for the most part, but these krisps are different both in taste and consistency. First of all, they are very thin and crunchy not thick and rice-y like many low calorie rice crackers/chips that are on the market today (you can kind of see the difference from the picture). Second of all, the flavoring is really yummy, and done well enough to fill that Sour Cream and Onion craving that I just can't avoid sometimes. 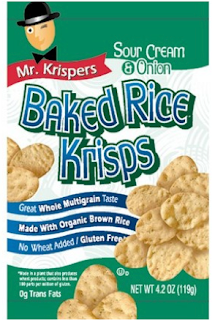 Lastly, the ingredients in these krisps pass my label test (and are gluten free, which is a plus for those readers that can't eat gluten), and the serving size for them is ~35 crackers (120 calories, 2 WW points (note: some flavors are just barely above the 3 line)) which is really big and filling. So, if you like to snack a bit during the day, you might want to consider weighing out a serving of these crackers and taking them with you to work or on-the-go so you can have a small handful of krisps every couple of hours. Although, I've only tried the Sour Cream flavor, I looked up the Mr. Krisper site, and was intrigued to see that they come in 5 other potentially yummy flavors: Sea Salt and Pepper, BBQ, Sun Dried, Nacho, and White Cheddar and Herbs. I also see they have a store locator for the US and Canada on their site (always very helpful for tracking down foods that people recommend online). I also added them to the Yummy Diet Food Amazon Store, in case you can't find them in a store near you. Anyway, I'm not lucky enough to have these very yummy sounding flavors available at my local Whole Foods, where I buy the Sour Cream kind. So, if you've tried these other flavors please comment and let everyone know if they are as good! They are a closer to a quarter. They are oval shaped. Also nice and thin. Tasty too!